The Add Location Wizard is opened from the Location Tab or the Definition Page. It is used to add a new location to a target definition. On the first page you must select a type of location to add. Click once on a location type to select it and a description of that location type will be visible at the bottom of the wizard. Directory - Select a directory and all plug-ins found inside of it will be added. Installation - Select the directory of an Eclipse installation or Eclipse based product. All plug-ins installed into the application will be added. Features - Select one or more features from a directory and the plug-ins in those features will be added. 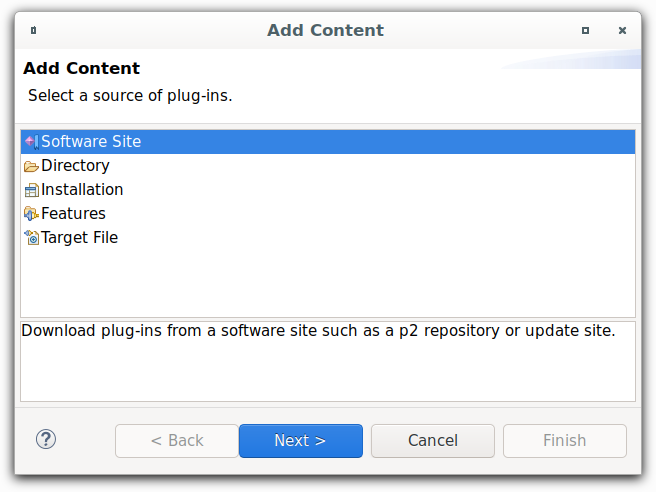 Software Site - Select software from an update site or p2 repository to add to the target.